Don’t be that guest! 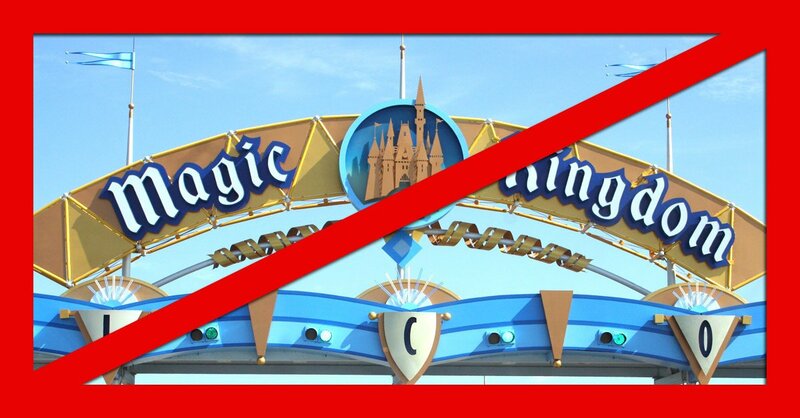 Here are twelve ways you could be kicked out or even banned from Disney property. We’ve all seen the videos of little children punching characters in the leg or chest. While these gestures are often overlooked, adults should not follow in their footsteps. Life bans have been distributed to several people who have taken a swing at Mickey and his pals. Treat others the way you want to be treated. While it seems easy enough to understand, multitudes of guests still blatantly ignore this principle. Cast members have called in being threatened and have even had drinks thrown in their faces. A cast member can call security and have a guest escorted out. Be it Epcot’s World Showcase Lagoon or Cinderella’s moat, there are accounts of guests swimming in each and getting kicked out with a life ban. At hot as the weather gets at Disney, please keep your clothes on. Disney cast members are instructed to ask indecent guests to put on clothing. If they refuse, he or she may be subject to removal from the park. Sometimes guests will display profane hand signs and or gestures on rides involving a camera. While most of them are edited out by a cast member, said cast member can still report the troublemaker. Disney must remain a family environment, and in some cases, guests have been asked to leave for their behavior. As of the summer of 2015, selfie-sticks have been permanently banned from Disney parks. If a cast member spots you with one, he or she is instructed to take it from you. You would then pick up your stick at the front of the park at any time. Refusing to comply will get you kicked out. Unless it is a special event, guests over the age of fourteen cannot dress up as a Disney character. Save the Ariel dresses and Peter Pan costume for Mickey’s Not So Scary Halloween Party, or 24-Hour Day. Even on those days, impersonating a character, signing autographs and posing for pictures can get you thrown out. All parks have locations where smoking is permitted. Smoking in a prohibited area poses a threat to other’s health and safety, especially on a ride. Ride intrusions happen all too often. On slower rides without lapbars, guests have jumped out to explore the scenery. Unbeknownst to them, a floor sensor has been triggered the instant their feet touch the ground. This immediately stops the ride and prompts a cast member to walk the track in search of the perpetrator. Guests see their share of cast members and characters dashing behind designated doors. Sometimes curiosity gets the best of them, which leads to a backstage adventure. Everyone makes mistakes, but if a guest is caught traveling far into unauthorized areas, they will most certainly be kicked out. Cutting is strictly prohibited. It is also the reason for two fastpass touchpoints. If a guest is caught hopping fences and gates to get to the front of the line, they will be removed from property. Guests are not supposed to feed Disney’s famous ducks or any of the other animals that skitter about the parks. Doing so disrupts their feeding patterns and causes them to swarm certain areas. Cast members can ask a guest to stop, and can have them kicked out if they refuse to. Michael is a former Disney cast member, online novelist, and aspiring author. He hopes to return to Walt Disney World and become an Imagineer on the writing team. He currently resides in Naples, Florida.